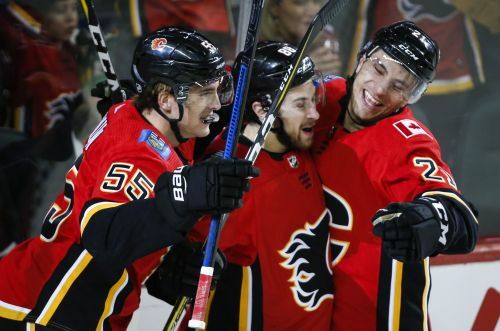 The Calgary left wing scored three goals for his first NHL hat trick and added an assist to lead the Flames to a 6-3 victory over Vegas on Sunday night that snapped the Golden Knights' six-game winning streak. "They were awesome," Tkachuk said of linemates Mikael Backlund and Michael Frolik. "Gave me a couple tap-in birdies there, a couple open nets. They were awesome tonight to play with." Backlund added two goals and an assist for the Flames, who ended a four-game skid to move back atop the Pacific Division standings ahead of San Jose. Frolik had four assists as the line combined for 11 points. "Right off the hop, we skated well, had some energy," Backlund said. "I thought all night we had some good forechecks. We made some good plays, smart plays. Overall, both Fro and Chucky had a good night. We're, of course, happy and satisfied with helping the team win." Andrew Mangiapane also scored for Calgary, while David Rittich made 25 saves to improve his record to 23-7-5. Brandon Pirri, Reilly Smith and Mark Stone scored for the Golden Knights. Malcolm Subban finished with 29 saves. Backlund redirected Rasmus Andersson's point shot past Subban with 21.8 seconds remaining before the second intermission for a power-play goal to put Calgary ahead to stay at 4-3. Tkachuk one-timed a pass from Backlund past Subban at 15:43 of the third period before rounding out the scoring with an empty-net goal. "The start wasn't there tonight and ultimately that cost us," Vegas forward Max Pacioretty said. "They're a good team for a reason. They were hungry for that win tonight." Mangiapane opened the scoring for the Flames at 2:40 of the first period when he snapped a shot over Subban's left pad after finding himself all alone with the puck in the slot, thanks to a nice pass from linemate Garnet Hathaway. Backlund put the Flames up 2-0 at 7:37 when he skated across the blue line and let go a long-range wrist shot that beat Subban over his left pad again. Pirri converted a nice pass from Alex Tuch at 14:40 of the first to pull the Golden Knights back within a goal. Situated behind the Calgary net, Tuch kicked a hard pass from Cody Eakin onto his stick before quickly throwing it out front to Pirri, who one-timed the puck into the top corner behind Rittich. Tkachuk extended Calgary's lead to 3-1 with 62 seconds left in the opening period when he tapped a cross-crease feed from Frolik past Subban, who got a piece of the puck with his stick. Smith and Stone were also the beneficiaries of nice passes from their linemates early in the second period as the Golden Knights tied it at 3. Smith took a pass from William Karlsson and backhanded a shot in behind Rittich just 21 seconds into the period before Stone one-timed a feed from Paul Stastny past the Calgary goalie 59 seconds later. The Flames had a great chance to take the lead back a short time later, but Subban made a nice glove save to stop a backhand shot from the slot by Johnny Gaudreau. Rittich then stood his ground to turn aside a breakaway attempt by Jonathan Marchessault at the other end of the ice. "The early two goals put us behind and we started chasing from there," said Vegas coach Gerard Gallant, who didn't fault Subban for the loss. "He made some key saves at key times when it was 3-3. He kept us in that game. We just gave them too many good chances." NOTES: Playing in his 100th NHL game, forward Austin Czarnik earned an assist on Backlund's second goal. ... Stastny has recorded nine points (two goals, seven assists) in his past eight games for the Golden Knights. Golden Knights: at Dallas on Friday night. Flames: host New Jersey on Tuesday night.